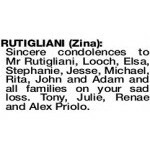 The Funeral Mass for the late Consiglia (Zina) Rutigliani of Stirling will be held at Villa Terenzio Italian Aged Care, 33 Kent Rd, Marangaroo THURSDAY (4.4.2019) commencing at 11am. 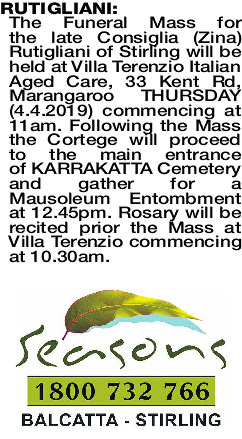 Following the Mass the Cortege will proceed to the main entrance of KARRAKATTA Cemetery and gather for a Mausoleum Entombment at 12.45pm. Rosary will be recited prior the Mass at Villa Terenzio commencing at 10.30am. Born 25.01.1926. Passed peacefully 27.03.2019. Beloved wife of Gianni. Devoted mother of Michele and Luciano. Treasured mother-in-law of Rita and Elsa. Adored nonna to John and Morgan, Adam, Stephanie and Jesse. My darling Nzina, thank you for the best 57 years of my life. I will miss you for the rest of my days. Until we meet again, rest peacefully in the arms of Jesus. Mum, you were the kindest person. Always giving to others before yourself. Even when your Dementia took over you never lost your sense of giving. We will miss you. Life will not be the same without you. Your loving son, Michele, daughter-in-law Rita and grandchildren John, Morgan and Adam. Cara Mamma, thank you for always being there for me and my family. Our lives will never be the same. We love you and we miss you. Your loving son Luciano, daughter-in-law Elsa, grandchildren Stephanie and Jesse. To our brother-in-law John and all the family, our deepest condolences on your sad loss. May my loving sister rest in peace. 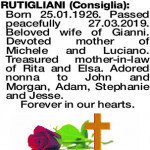 RUTIGLIANI CONSIGLIA In loving memory of my dearest sister Consiglia (Zina). Deepest sympathy to John, Michael, Luciano and families. I will miss you and I am grateful for everything you have done for me. Lino and family. 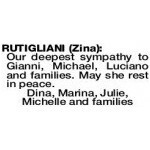 To Uncle John, Michael, Luciano and families our deepest sympathy on the sad loss of Aunty Zina. Our thoughts and prayers are with you. Enzo, Lucy, Robert, Lillian, Angelo Monastra and families. 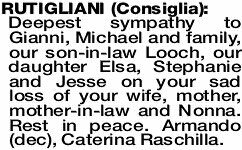 Deepest sympathy to Gianni, Michael, Rita and family, our brother-in-law Looch, Elsa, Stephanie and Jesse. Rest in Peace. 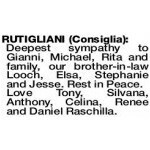 Love Tony, Silvana, Anthony, Celina, Renee and Daniel Raschilla. 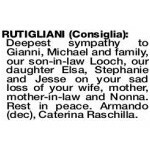 Deepest sympathy to Gianni, Michael and family, our son-in-law Looch, our daughter Elsa, Stephanie and Jesse on your sad loss of your wife, mother, mother-in-law and Nonna. Rest in peace. Armando (dec), Caterina Raschilla. Our deepest sympathy to Gianni, Michael, Luciano and families. May she rest in peace. 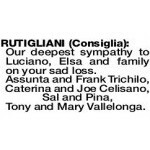 Our deepest sympathy to Luciano, Elsa and family on your sad loss. Assunta and Frank Trichilo, Caterina and Joe Celisano, Sal and Pina, Tony and Mary Vallelonga. 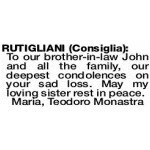 Sincere condolences to Mr Rutigliani, Looch, Elsa, Stephanie, Jesse, Michael, Rita, John and Adam and all families on your sad loss. Tony, Julie, Renae and Alex Priolo. 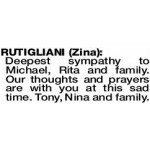 Deepest sympathy to Michael, Rita and family. Our thoughts and prayers are with you at this sad time. Tony, Nina and family.